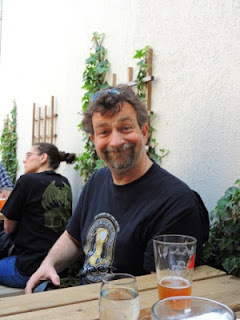 Teena and I are members of the Toronto Beer Lovers Meet-up Group and this afternoon there was a pub crawl along Ossington Ave led by Ken Woods, owner of Black Oak Brewing Co. I really like Ken. He is a very personable, easy to get to know person, plus his brewery makes great beer. I love their Pale Ale, Summer Saison and 10 Bitter Years. We met just before the patio of Bellwoods Brewery opened at two and there was a dozen or so of us to fill up a few of picnic tables out in the sunshine when they opened the door. More came in as the afternoon went on. It was a fabulous afternoon in the sun. We met a lot of interesting people and had some great beer. The Samurai Sauvin Saison was my favorite. Teena enjoyed the Twin Peach. After a few hours we moved to a bar on Dundas called Get Well. I liked this place not only do they have a decent beer selection, but they also had some old video machines and more important...PINBALL! I have always loved pinball machines and it has been a very long time since I have played one., My first game I lucked out winning a few free games. I had forgot about that wonderful, loud CRACK of a free game being rung up. In the end I walked away winning 15 free games. Everyone seemed to enjoy their selves away from the machines. Most headed off to Thirsty and Miserable up in Kensington Market after. We were too close to home to wander away from it, so headed home instead. Thanks Ken for organizing this walk. We had a fabulous time!. Best part...Monday is a holiday!